Heat Pumps transfer energy from one location where it is not required (the ‘source’) to an area in which it is required (the ‘sink’). The main two types installed by Heat Pump Installers in a home or business property are air source and ground source systems. Connected to pipes which are installed underground, ground source heat pumps extract heat from the earth which can then be used in a variety of ways, such as for central heating, underfloor heating or warm air heating systems. Working in much the same way as refrigerators, liquid coolant (water and antifreeze) is pumped around the circuit, taking warm energy from the earth into a heat exchange inside the house, whilst absorbing cooler air from inside the house which is taken back outside. Heat pump installers will lay pipes at a depth where the temperature remains relatively level (around 2 metres generally) meaning the system can be used all year round, even if there is a frost or snow on settled on the ground. Depending on how much space you have available in your property, the pipes will either be laid horizontally, in the common coiled design helping to reduce the amount of ground required, or is space is extremely limited, the pipes can be fed down a borehole in a vertical manner. Ground Source systems are eligible for the Government’s Renewable Heat Incentive, which pays 9p per kWh of heat generated, making the system not only beneficial in terms of saving money and reducing your impact on the environment, but it will also make you money. The system is often considered most suitable to be used in conjunction with underfloor heating systems. This is because underfloor systems only need a temperature of around 25- 30 degrees Celsius, as opposed to conventional central heating systems which require water temperatures of around 60-70 degrees Celsius. This heating technique is known as “trickle heating”, which means that a lower temperature is outputted over a longer period when compared to gas-powered central heating for example which delivers a burst of heat to raise the temperature. You may find that during the coldest periods, your heating will need to be left on at all times, but as you are not paying for fuel to heat the system, this won’t have an impact on bills. Due to the nature of trickle heating, your property will need to be well insulated. This is because a ground source heat pump will battle and struggle - or even fail - to raise the temperature in a building which is constantly loosing heat. As the name suggests, air source heat absorbs draw warmth from the outside air to be used in much the same way as ground source systems, although they have the added benefit of being able to directly pump warm air into a room or property. Even in temperatures way below freezing (as much as -15 degrees Celsius) air source heat pumps can still operate. This can also be likened to a fridge; even though your fridge is only a few degrees, if you put your hand behind the fridge, it will be warm. Heat, even at low temperature is absorbed into a liquid which is then passed through a compressor, the compression forces the temperature to rise meaning it is then usable for trickle heating your home through systems such as underfloor heating, radiators or direct air convectors. Considerations for air source systems include ensuring you have ample space for the system to be installed. It cannot be installed in a tight location as it requires a free air flow. A recommended location is a wall which sees direct sunlight exposure. If you are unsure about which system is best for you, talk to a heat pump installer today, who will be able to talk you through the benefits of both systems, and help you decide which is best-suited to your property and situation. You can also view alternative sources of green energy generation suppliers though additional sites like www.findbiomassinstallers.co.uk for UK biomass system installers or www.findsolarpanelinstallers.co.uk for solar system installation and supply. A heat pump is a device that transfers heat energy from a source of heat to what is called a “heat sink”. A it’s an electrical device that extracts heat from one place and transfers it to another. In HVAC applications, a heat pump is typically a vapor-compression refrigeration device that includes a reversing valve and optimized heat exchangers so that the direction of heat flow (thermal energy movement) may be reversed. Generally speaking, a heat pump can generate three to close to five kilowatts of heat for each unit of energy it consumes. Coefficient of Performance (CoP) of an air source heat pump can be up to 4. The heating capacity of the air source heat pump will also tend to decline as the outside temperature decreases. As the weather gets colder the heat pump will need to run for longer. A solar-assisted heat pump is a machine that represents the integration of a heat pump and thermal solar panels in a single integrated system. 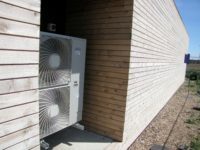 An air source heat pump uses atmospheric air outside a property, whereas a ground source heat pump uses warmth in the ground as the heat source. If a conventional air source heat pump is used in colder climates, the system needs an auxiliary source of heat to supplement the heat pump in the event of extremely cold temperatures or when it is simply too cold for the heat pump to work at all. Assuming that it has been sized and installed correctly, a heat pump can supply more than enough heat for both space heating and hot water. Whereas traditional fossil fuel boiler systems work by producing on-off bursts of heat to maintain the desired room temperature, an Air Source Heat Pump will work much more efficiently by supplying hot water to the radiators at a lower yet more constant temperature. A ground source heat pump is more suitable for new build properties than retrofitting to an existing home. However, if you can accept the disruption it is perfectly possible to retrofit such systems. A ground-source heat pump is considered as one of the most efficient heating choices because of its heat source – Earth itself. While heat pumps with backup systems other than electrical resistance heating are often encouraged by electric utilities, air source heat pumps are a concern for winter-peaking utilities if electrical resistance heating is used as the supplemental or replacement heat source when the temperature drops below the point that the heat pump can meet all of the home’s heat requirement. A heat pump can do everything a traditional fossil fuel boiler can, including provide domestic hot water. Admittedly heat pumps don’t normally warm water to above 60 degrees Centigrade. But, on the other hand, rarely do people need water over 60 degrees. So, by maintaining that temperature, no added energy is needed beyond what the highly efficient heat pump can produce. The UK government subsidizes (until autumn 2018) heat pumps through the Renewable Heat Incentive (RHI). The nature of the RHI allows homeowners to recoup enough funds so that in the long run, their heat pump will have cost them no more than a replacement boiler (subject to performance). In fact, by installing and integrating solar panels, the amount of electricity required by your heat pump will mean that, from a consumption perspective, it can operate at a CoP of 7 or more. Generally, if you have the right property, a heat pump will save you money over oil or gas based heat sources. But we recommend that these installations be regularly serviced. Investment costs for gas heat pumps are typically higher than for conventional heat pumps that run on electricity or gas fired boilers. While it depends on your unit, the climate you live in and how often you use it, a regularly serviced heat pump will last much longer than one that is not. Whereas traditional fossil fuel boiler systems work by producing on-off bursts of heat to maintain the desired room temperature, an Air Source Heat Pump will work much more efficiently by supplying hot water to the radiators at a lower yet more constant temperature. Heat pumps can save you more on your heating bills if you’re replacing an electric, oil, LPG (liquefied petroleum gas) or coal system, rather than gas. Air source heat pumps can perform better with underfloor heating systems or warm air heating than with radiator-based systems because of the lower water temperatures required. 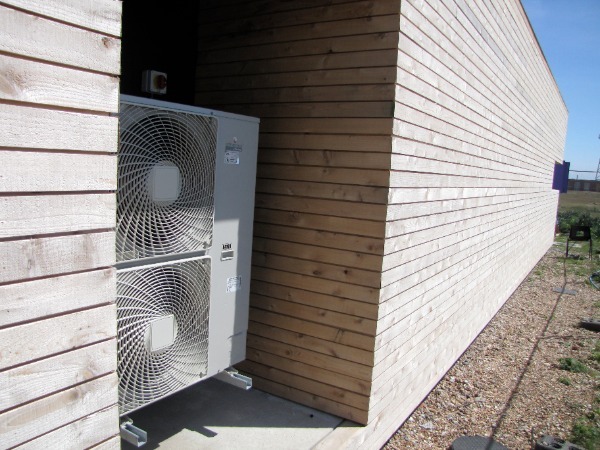 Heat pumps can generate less CO2 than conventional heating systems. Heat pumping is a mature and proven technology, with readily available equipment, offering in many cases a cost-effective way to save energy and benefit the environment. With respect to primary energy and global warming, sorption cooling and heat pumping is coherent with emissions reduction, but to be so, the cooling CoP must be larger than about 1 or 1. Quick! Free Listings for Quality Heat Pump Installers! Consider engaging a member of the UK's Ground Source Heat Pump Association, the Professional Body for Quality Installers in the Industry. Use these towels and help preserve our forests! Biogas - Did you ever consider Renewable Energy from your vegetable/ organic waste? Check this out!